Life's Abundance Ultra Pure Fish Oil is More Effective! Scientists and researchers found that the Eskimos found in Greenland have very little coronary heart disease when eating their native diet which is very high in fat. Most of fat in their diet comes from sea mammals and contain large amounts of the same long-chain omega 3 fatty acids found in fish oil. The American Heart Association has recommended that healthy people consume omega-3 fatty acids from fish and plants to help protect their heart. Health food fish oils and cod liver oil are not pure enough to safely consume in large enough quantity to feel the potential benefits. Highly purified high dose ultra pure fish oil is a more concentrated source of omega-3 fatty acids, free of dangerous toxins found in other oils, and has been tested clinically. The growing importance of long-chain omega-3 fatty acids in the diet have been validated by leading medical researchers, universities including Harvard Medical School and the American Heart Association. Due to pollution, the fish in our oceans are contaminated with toxins such as mercury, PCB's and dioxins. If consumers choose to get Omega-3 fatty acids from fish oil, they must be very careful when choosing a fish oil supplement. Make sure you choose an ultra-purified fish oil that is tested by an independent third party for concentration, purity and stability such as Lifes Abundance Fish Oil. All fish oils are not alike. If you take fish oil for omega-3 supplementation be sure and consume "ultra pure". Life's Abundance ultra pure fish oil is much more concentrated so you obtain much more benefits from a given dosage and toxins such as PCB's, dioxin, mercury and oxidized lipids have been removed. Typical health food grade fish oils are not ultra pure. The only way to be sure is to ask to see third party laboratory anaylsis of the finished product. It should contain at least 60% long chain omega-3 fatty acids (EPA + DHA), less than 45 ppb PCB's and less than 1 ppt dioxin. More information about highly purified fish oils can be found at the International Fish Oil Standard website. 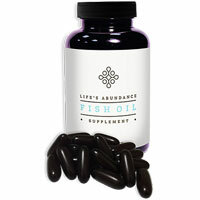 You will find the test results for our fish oil listed under Life's Abundance. Independent Field Representative. Products shipped from Life's Abundance. 30 day money back guarantee.